The winner of "The Next Sneaker Design Star" competition will be announced next week, and right now Bryan Espiritu and Andy Oliver have a comfortable lead. Don&apos;t sleep on Kyle Hodge, though, who&apos;s got no competition for second place at the moment. While the slick Espiritu/Oliver design is on point, Hodge&apos;s shoe incorporates the Creative Recreation signature lace guard. As mentioned previously, the winning designer will be given a multi-day apprenticeship at Creative Rec, so taking cues from the existing silhouettes was a smart move. Even if you didn&apos;t design a sneaker, there&apos;s something in this contest for you—once you vote, you can register to win great prizes, like a $250 Karmaloop gift card or a new pair of kicks. There&apos;s less than a week left to vote, so don&apos;t wait! For up-to-the-minute info on the contest, follow @ComplexSneakers, @creativerec, and keep an eye out for #cr8reckicks on Twitter. 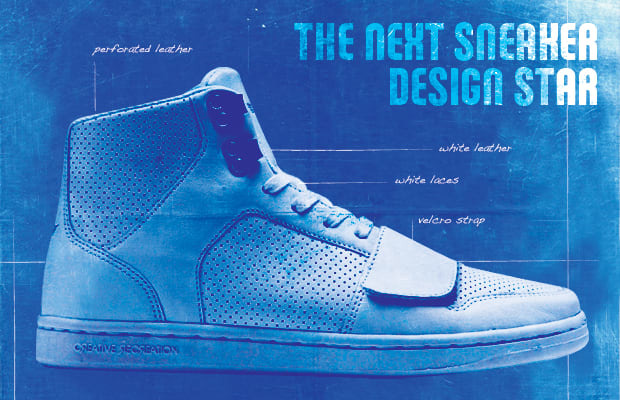 VOTING IS NOW CLOSED FOR "THE NEXT SNEAKER DESIGN STAR" COMPETITION. PLEASE CHECK BACK NEXT WEEK FOR THE ANNOUNCEMENT OF THE WINNER!